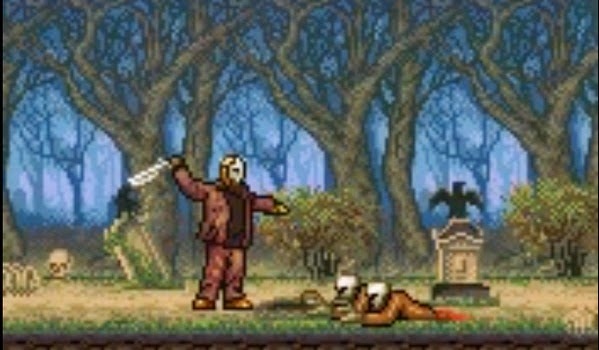 Jason Voorhees, Freddy Krueger, Predator, Michael Myers, villains who won projection for their cruel deeds, but rarely their success has been reproduced in video games. See some of these titles that tried to bring terror and suspense to the gaming world. One of the most known titles in this category is the Friday the 13th for Nintendo 8 Bits. The game blends action and adventure putting you in the role of one of the monitors Camp Crystal Lake while avoiding undead and explore the huts in a pseudo 3D to uncover clues of how to end Jason. It was a very confusing game and did not make much justice to the character, who did not look intimidating. Freddy Krueger was also present on the Nintendo 8 Bits in a fairly ambitious game, but confused. Controlling several teenagers you need to get Freddy bones to burn them, going through levels full of monsters and animals. The great thing is that the adventure takes place both in the real world and the dream, the second more difficult. Something curious is that the game allowed multiplayer for four people with a special attachment. The Predator was one of the villains of cinema that received more games through the generations. One of the first to call attention to the Predator was Nintendo 8 Bits. Although only a reasonable action game, he stood out for times when the graphics were really impressive, with scenes of the film scanned or very large versions of the hero, Major Alan "Dutch" Schaefer (played by Arnold Schwarzenegger) and Predator fighting in what was called "Big Mode". Probably the first horror game for video games to be a movie based on the game of The Texas Chainsaw Massacre was considered extremely violent for its time, despite being almost comical now. Controlling own Leatherface players walked through a field in looping while slashed all heads. One of the few games to put you directly in control of Jason, Road to Hell is an old game for Nokia mobile phones of yesteryear. In it you embody the very psychopath Jason hacking various monsters on your way to hell. Despite the limitations of the time the gameplay was extremely repetitive. Unlike other list of games, Hellraiser was never released, probably for being too ambitious. The game was planning to use a special cartridge with its own processor intended intercept the Nintendo 8-bit information and manipulate it, thus creating graphics far above the capacity of the console. The end result would be a visually stunning game in Doom style, where the player would be trapped inside the mysterious cube and the film would have to find a way out. The sequence of the movie Predator assured the arrival of a game for video games, this time for the Sega platforms. Versions of Mega Drive and Master System are completely different, but both put the player in the role of Sergeant Mike Harrigan (played by Danny Glover in the film) having to face street gangs and the Predator himself. The same producer of The Texas Chainsaw Massacre, Halloween game for the Atari 2600 gave an extra step in the violence, with children being killed and beheadings. Strangely the game does not mention the name of the characters, as the killer Michael Myers but carries the theme song of the series with an impressive level of quality. The only Jason 3D game is not an official product, but a game created by a fan who decided to take the character of the refrigerator. Although well rudimentary graphics and animations, Friday the 13th 3D fun a bit to bring Jason doing what he does best: killing all who appear in front of you. The success of the franchise Nightmare On Elm Street still caught the fever arcade Pinball kind, inspiring a popular table in his time. Freddy Krueger was present with a large head whose mouth moved with speak and sometimes even threw the metal ball. The first time the Predator and Aliens faced in video games was through a large game produced by Capcom for the arcades. Choosing between two human and two predators, players walked the stage in style Beat'em Up, beating all the aliens that appeared in front of him. It is worth making a special mention to the fighting series Mortal Kombat, which has brought some of these great villains as special guests. After your reboot which featured the unusual presence of Freddy Krueger, the sequence will now none other than Jason Voorhees from Friday the 13th and the Predator himself to face iconic figures such as Scorpion and Sub-Zero.